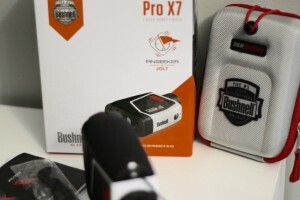 There was a lot of hype around the Bushnell Pro X7 when it came out, and for good reason. This rangefinder is the most accurate you’ll find on the market today, and only a couple minor things to criticize. We loved the X7 enough to name it Best Rangefinder in 2016. Straight out of the box you’ll notice this rangefinder takes up most of the box and comes in a semi-hard zip-case, similar to the kind that nice pairs of headphones come in. The case has a carabiner clip to hang from your bag, which turns out to be necessary because of the size. I use a pretty small carry bag, like this one, so there’s not a ton of extra space. I could fit the X7 in my bag if I didn’t stuff my golf shoes in it. The battery comes included and I really didn’t need the instructions to get going. I didn’t realize it initially but the elastic loop allows you to access it without having to loudly unzip it while someone else is in the middle of their backswing. It’s a small but smart little feature that shows that Bushnell pays attention to the details, which makes me trust the X7 more. Hitting great approach shots means you need to be dialed in from short range. The X7 gives you an extra level of accuracy from .5 to .1 yard to give you extra confidence. You may not be accurate enough to need this precision now but you might need it once you see the impact on your game. This feature doesn’t make a huge difference in my game but love having it for a 40 yard toss shot that I practice all the time. I’m pretty dialed in with it so that extra 14 inches of accuracy can make a difference. Yes! I really do love this thing. I’m shooting distances during all my range sessions, and usually twice each hole. My game has improved now that I really know my distances — I can’t round up my distances like I used to — but I also swing more confidently knowing I have the right club to put me in a better position to score. The only downside is how big it is, but it’s a tradeoff I’ll happily make for the extra level of precision, extra magnification and how it’s easier to hold steady.